Early in 1974 Bishop Thumma Showry, then chairman of the Andhra Pradesh committee on catechetics, requested me to find a totally new approach to instructing adult catechumens. To explain the terminology of the time: catechising meant instructing someone about Christian faith and morals; the instructor was called a catechist; the persons being instructed in preparation for baptism were known as catechumens. I was at the time lecturer of Scripture at St John’s Major Seminary and director of planning at Amruthavani Communication Centre, Hyderabad. In the ten dioceses of Andhra Pradesh an average of 20.000 adult catechumens entered instruction every year. The Bishop, who was himself actively involved in giving instructions, had found the current programme highly unsatisfactory. To understand the situation, it may be worthwhile to briefly sketch the system as it then prevailed. Take a village like Kavuluru in Krishna District which hosted a population of 3000. 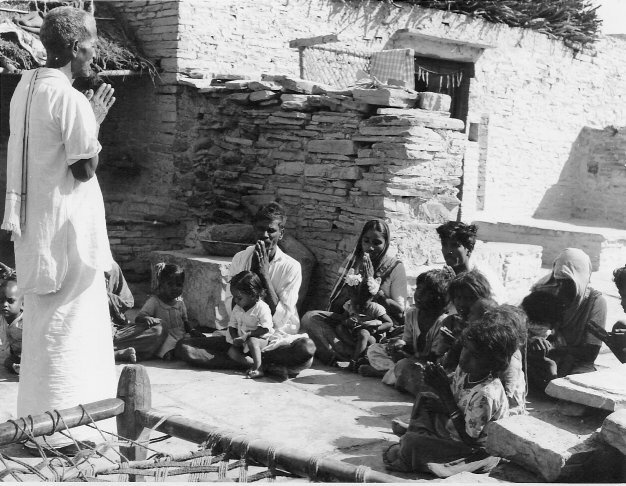 Once a group of Hindus in a particular village such as Kavuluru had expressed their desire to become Christians and proved their determination in concrete ways (for instance, by providing land for a community prayer hut), the parish priest would appoint a catechist to that village for a number of years. The catechist would visit the village two or three times a week and, in the evening after work, call the catechumens together for prayers and instruction. Catechist instructing a small number of catechumens. Being normally poorly educated himself, the catechist would rely heavily on the penny catechism of ready-made questions and answers, with the standard catechist handbook for further explanations. His ultimate aim would be to make people learn some of the questions and answers by heart. He would also teach everyday prayers such as the Our Father, the Hail Mary, the Creed and the Glory be to the Father. The parish priest, who typically would have twenty or more outstations and catechumen villages on his hands, would drop in once or twice a month to supervise the instruction and supplement it with his own teaching. 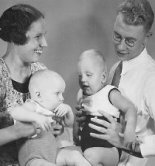 During the final months before baptism the priest would come more frequently, examine the people regarding their knowledge and prepare them for receiving the sacrament. Both the penny catechism and the catechists’ handbook were straightforward translations in Telugu of French books imported by missionaries one hundred years earlier. [i] The book failed in many respects. Its scholastic treatment of Christian doctrine, which may have had its use in post-Reformation Europe, was completely out of place in the Indian context. Much of the instruction consisted in explaining new terminology specially coined to accommodate the old scholastic[ii] concepts. Within the section on original sin, for instance, the converts were presented with more than twenty new terms, many of which had been artificially composed. The word for “original justice” was a Sanskrit compound of twelve syllables: parishudhdhâmunubhâgyamainasthiti. Unnecessary difficulties arise from the insistence on scholastic distinctions that cannot be readily understood and that have little theological relevance. The distinction between ‘will’ and ‘intellect’ is crucial in medieval theology: but Telegus use the same word for both of them. This preoccupation with notional terms and with making people learn phrases by heart usually made such instructions a soul-destroying business, not unlike forcing people to eat indigestible glue. There was little regard for the real needs and thinking of the audience; there was hardly any feedback; there was no scope for engaging emotion or imagination. That the system did produce results at all may be ascribed to the common sense of the priests and catechists who made up for some of the obvious deficiencies by adapting the presentation. Now at that time I myself I had begun to experiment with teaching in a new way: through scriptural stories. I had come across this methodology when I had attended a retreat by an American scripture scholar in Rome. Regretfully I have forgotten his name. But his way of giving lively conferences had impressed me. 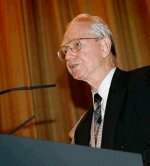 He would vividly re-tell stories from scripture and then punctuate them by to-the-point lessons for modern life. Moreover, in India, I had been intrigued by the indigenous story-telling tradition. Next day, in my lecture to the top-level of theologians, I talked about my discussion with Bishop Thumma. No one responded. Just silence . . . I made another plea. Again no response. I must say that I was deeply disappointed. I felt deflated. I had always got on well with the students – we were real friends. Why no response? I had to wait for five days. Then they suddenly turned up in my room: eight volunteers who had proved their skills in writing Telugu articles. Their names were: Vuddavôlu Vijayaprasâd; Pasupulêti Francis; Pâmishetti Arôgyam; Gantêti Mariadâsu; Pûdôta Innayya; Narishetti Bâlashowrayya; Pâmishetti Marianna and Gude Baltazâru. A resourceful and creative team. With their help I developed a whole new approach, which received the name of Mukti Margam [= the road to salvation). The approach incorporated some new features, revolutionary from the point of view of both catechetics and communication. In rural India, story-telling is still an influential social form of communication. Indian tradition possesses a treasury of thousands of stories, preserved in epics such as the Râmâyana and the Mahâbharata, and in the thirty-six major and minor Purânas. Professional actors and narrators bring these stories in traditional forms: the harikatha, kathâkalâkshêpam and burakatha. The stories have the outspoken purpose of instilling religious and social values. Indian narrative has another distinctive feature in that it often presents stories within stories. A treatise on moral virtues, the Pancha Tantra, offers a long narration about the animal kingdom which is frequently interrupted with smaller stories to illustrate individual points. Against this background, Mukti Margam was designed to contain twenty-five units, each of which consisted of one main story (from Scripture) and three sub-stories (from everyday life). To show how it works in practice, consider unit twenty-one on forgiveness of sins. The instruction is based on the story of the leper Naaman who is cured by the prophet Elisha. This main story is interrupted three times to allow for explicit instruction on: the need for acknowledging one’s own sinfulness; forgiveness of sins through the sacrament of penance; renewal of life. Each of these three items of instruction is promptly illustrated by a sub-story: about a beggar who became a thief; about Ananias and Sapphira; about the conversion of a rich man who had exploited his fellow-villagers. With examples from the Gospels thrown in, the whole unit was welded into one big story with instructions and illustrations intermingling in true Indian fashion. To tie in with existing catechetical practice as much as possible, each unit was made to lead up to a portion of the prayers that had to be learnt by heart. The first six units, for instance, led up to successive parts of the Our Father so that the catechumen could associate the Our Father with the stories heard and the lessons learnt. 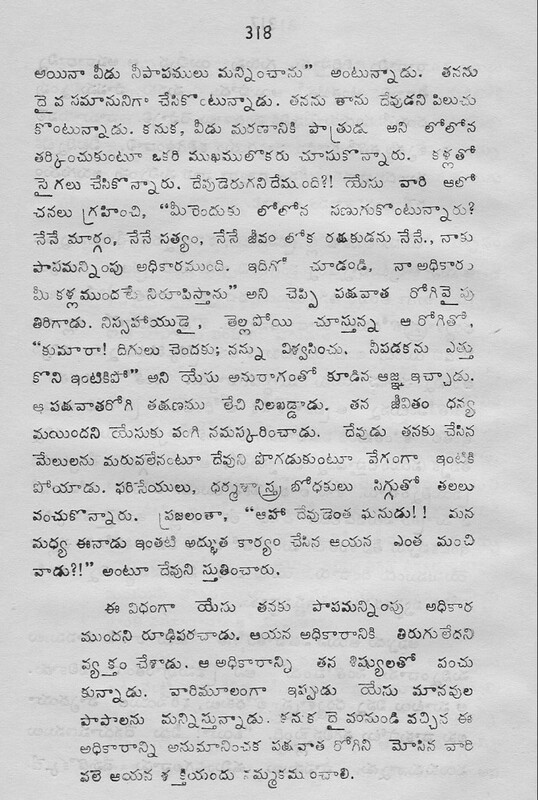 Random page from Mukti Margamu. The book with its twenty-five story-telling lessons, Mukti Margamu was published in 1976 and consisted of 394 pages. The printed text was accompanied by the following aids: a parallel correspondence course; cassettes with Telegu Christian songs related to the various units; a series of slides at four key points within the course; posters to accompany the stories of each unit; training courses for catechists in the Mukti Margam approach; and dramatised versions of the Mukti Margam stories broadcast in the Telegu radio programmes of Radio Veritas. My work in constructing the Mukti Margam approach brought me to another realization. In all Christian communities I knew, the leader – whether priest, religious, catechist or lay teacher – played a key role. Success or failure in transmitting the message depended mainly on him or her. But did they know how to tell stories? When I started teaching Scripture I concentrated on exegesis as, I am sure, most of my colleagues did. Soon I discovered that religious instructors need to be given much more than static information about the text. I came to see that the lack of training in communication was a serious deficiency in the syllabus. With their heavy emphasis on academic formation, Scripture courses failed to teach future priests, teachers and catechists how to pass on their knowledge. The students were taught how to think critically, not how to express themselves creatively. They were given information about scriptural texts, not shown how to communicate these texts effectively to different audiences. As it happened, I was given the task, one year, of teaching a course on homiletics, the art of preaching, to senior theologians in St John’s Major Seminary. I made the students prepare sample sermons – and was appalled. I also started to critically analyse the Sunday sermons which, in St John’s Seminary, were always preached by one of the deacons. Dreadful. Let me give one example. A usually bright student preached on the multiplication of the bread. His sermon opened with a reiteration of the traditional teaching on trans-substantation [the substance of the bread becoming the substance of Jesus]. Then he added a reminder of the Sunday mass obligation and a warning that no one guilty of a mortal sin should go to communion. “Did you not study the Eucharist in theology classes?”, I asked him afterwards. It turned out that the deacon, when planning his sermon, had simply gone back to the outdated penny catechism he had learned as a youngster. I was asking myself whether we as a staff – theologians, liturgists, moralists, scripture teachers – were not wasting our time. What were we teaching our students for? And this certainly also applied to scripture. Further analysis of sermons preached by young priests confirmed the anomaly. The Old Testament which constitutes 75% of the volume of sacred scripture and to which much seminary instruction had been devoted, was hardly ever referred to. The use of scripture was generally restricted to a thematic approach or a citation of examples. Many priests ignored the new exegetical insights learned in the seminary and reverted to their own high-school sources for ideas and inspiration. It was clear that if the teaching of scripture was to have any meaning at all, it would have to include a course on its effective communication. How to communicate the scriptural message? Another truth dawned on me. It was not just a matter of teaching the skill of communication as such that was needed so that someone good at teaching would automatically do the right thing. There are elements of scriptural communication I realised, that required specific attention. And here we come back to the element of narration. It is not by accident that most of Scripture is made up of story. Many religious instructors are inclined to present Christianity in the form of ‘argumentation’, a category that belongs to the realms of philosophy and science. Scripture, however, uses ‘narration’ and by this fact itself places the Word of God in the category of history and experience. It needs to be communicated as such, as narration. English edition of Communicating the Word. To help communicators of Scripture prepare for their task, I gradually developed a set of notes, printed on stencilled paper. It grew into a course on communication techniques. These included: forms of narration; sketching biblical persons in ‘portraits’; the exposition of biblical motifs and themes; witness and prophecy; theological perspective and other imaginative forms of elaboration. I added models of public Bible reading, as had to be done by lectors at Mass. I taught the course in St John’s Major Seminary in Hyderabad, but also to hundreds of religious and priests who studied at the National Catechetical Biblical Liturgical Centre in Bangalore. Participants of my course had to practice by using the techniques in sample sermons and instructions. Through feedback from those exercises I could refine the techniques. 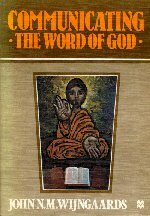 The course was published in 1978 as a book in slightly adapted versions for India and Great Britain under the title: Communicating the Word of God. 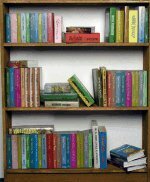 Editions in foreign languages followed: French (Paris 1982), Chinese (Hongkong 1985) and Spanish (Estella 1988). When giving retreats or spiritual conferences, I often used to take my starting point from a story in the Old Testament, digging out deeper symbolism of relevance for our Christian life today. 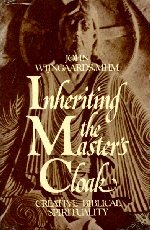 I bundled them together in Inheriting the Master’s Cloak which was published by Ave Maria Press in 1985. 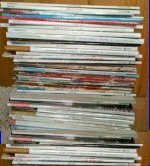 Other editions followed in India, Taiwan and the Philippines. In the USA it won, in 1986, a Catholic Press Association Award for “Best Adult Spiritual Reading”. [i] The standard manual at the time was Sathyôpadesha Vyakyânamu (Nellore 1930). [ii] The term ‘scholastic’ refers to the schools of theologians that operated in the European Middle Ages. They wrote in Latin. Their thinking was shaped by the philosophy of Aristotle.